Configuring First Data as the payment gateway in your Cart66 management console involves getting a gateway ID and terminal password to authenticate your Cart66 account so that it can talk to your First Data account. To use the First Data gateway you need to obtain a gateway ID and terminal password by going to the First Data site and logging into your account. 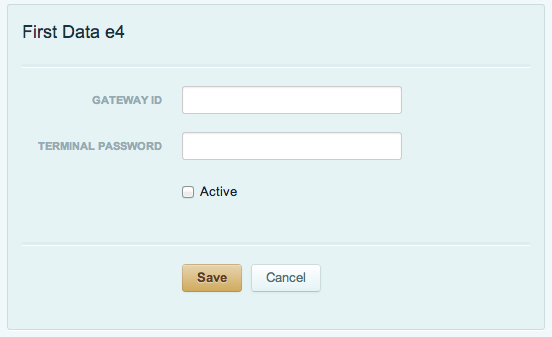 Once you get your gateway ID and terminal password, enter it into the First Data Gateway configuration panel in your Cart66 management console by navigating to Set Up > Payment Gateways > Configure A New Gateway > Select First Data and enter the gateway ID and terminal password as seen below.